No more worries of back connector breaking during install. Unlike other Brands or Older Models, this new heavy duty model gets rid of the screw in the back connector that sometimes would break on install. Enjoy high-speed HDMI and data connection in your home without tangled cables and wires making a mess! 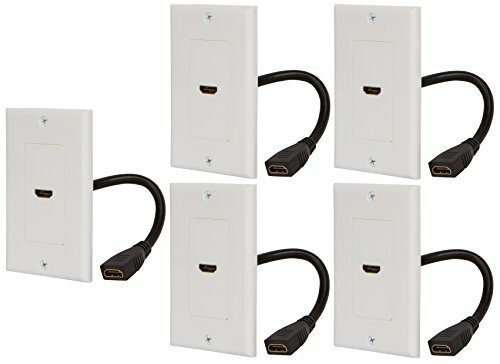 Your new HDMI wall jack features a built in 6 inch pigtail cable to provide easy-access female to female HDMI connection for your home theater system. With this plate you'll get standard HDMI (720p, 1080i) compatibility as well as the designated HDMI Ethernet channel for all HDMI Ethernet channel-enabled devices. Connect your video game systems, Blu-ray player and more - then sit back, relax and enjoy - all without the need for an additional Ethernet cable! Installs just like any light switch plate - simply fit the cable attachment into the outer casing, connect any cables as desired and then screw into the wall. It really is that easy! To maintain its neat and discreet design, this outlet port is a monochromatic white color - exactly the same as most light switch and power plug wall plates - allowing you to maintain a consistent color scheme throughout your home. Don’t wait to order the best HDMI/Ethernet wall plate on the market today! Click Add to Cart now to have your brand new 2-piece outlet insert rushed directly to your door!